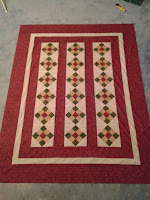 Many thanks to all for the advice about when/if to do diagonal joining of strips for borders - most instructive - it looks like there is no definite 'right' or 'wrong', so as seems normal for quilting it is a case of taking soundings, mulling over, then coming to a decision for what works best for me. 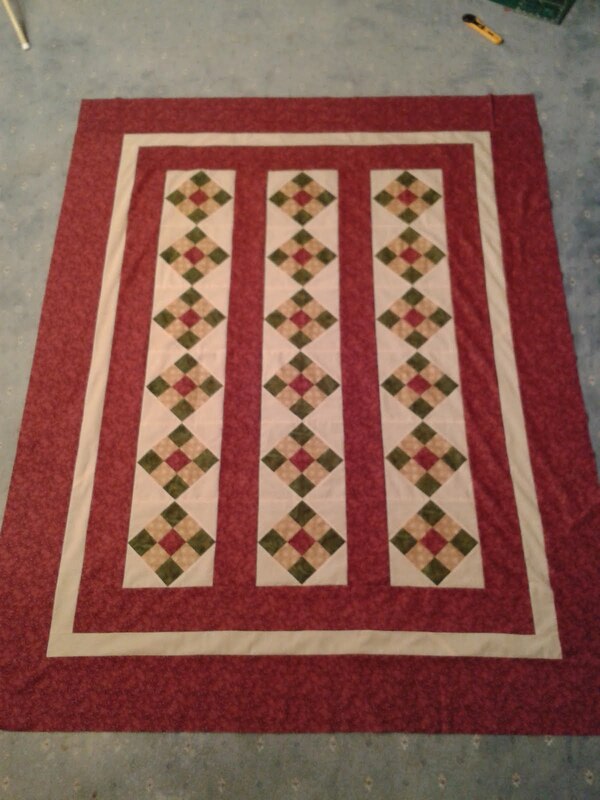 In this case, because I've done diagonal joins on the sashing, inner and skinny borders (and I have enough fabric), I've done diagonals for the outer border - and I'll continue with diagonal border for binding strips to keep the bulk down - but otherwise in future I will be butting up. So here is the top in all it's finished glory - all ready for the batting and backing fabric. Not being remotely forward thinking, I realised that I have no wadding and put a panicky order to ASding, and a couple of hours later had email confirmation that it had been packed and dispatched - thank you, Ali! getting tired just watching you!! Looking good, and I agree with your logic on how to piece your borders. Fingers crossed the Royal Mail do their bit :o). Really nice. It's a beautiful pattern, and you did it justice. Wow you are done already!!! It looks amazing! I love Bilbo's name for you! Have you decided yet how to quilt it? Oh it's lovely, good for you. Now how to quilt it. Can't fault the PO, Ali! Although the postmas was very grumpy at the big parcel! Thank you for your kind comments, Joanna & Mrs P.